ReNu MPS Multi-Purpose Solution was the first all-in-one multi purpose contact lens solution to be used by patients, and it’s still extremely popular today. Review Renu MPS Multi-Purpose Solution Flat Pack - 3 pack perfect result!!! Review Renu MPS Multi-Purpose Solution Flat Pack I have a day eye and this product was one of the most comfortable solution I’ve used to wash my contact lens. I recommend it. Review Renu MPS Multi-Purpose Solution Flat Pack Used for 40 years very happy with product. Review Renu MPS Multi-Purpose Solution Flat Pack In my opinion the best solution, have used it for many years and had no problems with it. Good for sensitive eyes and great value for money as part of a pack from Vision Direct, can be over £10 for 1 on the high street. Review Renu MPS Multi-Purpose Solution Flat Pack Lenses feel more comfortable to wear when using this than with supermarket own lens solution. Only problem is I seem to get through more of this than the supermarket one - possibly because packaging is designed so more comes out of bottle each time? But overall happy with it. Review Renu MPS Multi-Purpose Solution Flat Pack like the flat packaging! Review Renu MPS Multi-Purpose Solution Flat Pack Easy to store shape. Good product. Review Renu MPS Multi-Purpose Solution Flat Pack The solution works well for me, I have been using it for years. I love the 'flat pack', it feels like its reducing packaging and therefore waste. Review Renu MPS Multi-Purpose Solution Flat Pack Good value for money. Review Renu MPS Multi-Purpose Solution Flat Pack Flat pack - great value for money! Review Renu MPS Multi-Purpose Solution Flat Pack I got this as a freebie but it unfortunately really didn't agree with me - noticeably uncomfortable all day with the same pair of lenses, compared with the BioTrue (also Bausch & Lomb!) which I normally use. I would recommend BioTrue over Renu; until this I had no idea what a huge difference the solution can make! I wanted to just take my lenses out asap with this solution. Review Renu MPS Multi-Purpose Solution Flat Pack Good value! Review Renu MPS Multi-Purpose Solution Flat Pack Fast delivery. Review Renu MPS Multi-Purpose Solution Flat Pack really cheap, good price. Review Renu MPS Multi-Purpose Solution Flat Pack Good for dry sensitive eyes. Review Renu MPS Multi-Purpose Solution Flat Pack It is amazing. I can wear the lenses for a longer period of time. Review Renu MPS Multi-Purpose Solution Flat Pack Used other solutions. ReNu MPS good value for money. Review Renu MPS Multi-Purpose Solution Flat Pack Great value multi purpoose solution. Cant beat it for value. Review Renu MPS Multi-Purpose Solution Flat Pack great product. very happy. Review Renu MPS Multi-Purpose Solution Flat Pack Awesome!! Review Renu MPS Multi-Purpose Solution Flat Pack In the 22 years I have been using contact lens, I have tried many MPS. This is definetely my favourite and with vision direct I can save money. Review Renu MPS Multi-Purpose Solution Flat Pack Can't complain! Perfect! Review Renu MPS Multi-Purpose Solution Flat Pack Gave me three pairs of contact lens boxes for free and a lovely pack of Haribo ! Thank you. The solution is worth the money. Review Renu MPS Multi-Purpose Solution Flat Pack I bought it to wash the monthly disposal contact and not very impressed. a bit itchy for the eyes even after cleaning. Review Renu MPS Multi-Purpose Solution Flat Pack I have been using ReNu for a long time, so knew what to expect, but this packaging is an easier size for travelling. Review Renu MPS Multi-Purpose Solution Flat Pack Good value for money! Review Renu MPS Multi-Purpose Solution Flat Pack Very good and comfortable as always from ReNu. Review Renu MPS Multi-Purpose Solution Flat Pack Cheap, best quality, best bottle space saving! Review Renu MPS Multi-Purpose Solution Flat Pack The best one! Practice bottle, cheap price, best quality! Review Renu MPS Multi-Purpose Solution Flat Pack great price for solution. much better than in stores. Review Renu MPS Multi-Purpose Solution Flat Pack Would definitely recommend this product! Review Renu MPS Multi-Purpose Solution Flat Pack Good value for money. Felt like I made the right decision choosing this solution pack. Review Renu MPS Multi-Purpose Solution Flat Pack Sometimes these solutions can be harsh on the eye, even if not immediately they can add to general discomfort within no time at all. That certainly wasn't true of Renu. I hadn't changed brands for quite some time - we generally tend to stick to what we know or are comfortable with - but I'm glad that I took a gamble with this product. I'm certainly in the 'wont look back' category of buyer. Thanks for the recommendation and for sending out quickly. Review Renu MPS Multi-Purpose Solution Flat Pack Great solution. Review Renu MPS Multi-Purpose Solution Flat Pack Perfectly good enough for me. Review Renu MPS Multi-Purpose Solution Flat Pack Bought as an add on and because they were cheaper than where I normally purchase. Review Renu MPS Multi-Purpose Solution Flat Pack Used thsi product for years after trialling a few others. They manage to keep my lenses fresh and in my mind the best on the market. Review Renu MPS Multi-Purpose Solution Flat Pack This product is great value for money, and cleans the lenses well with great comfort. Review Renu MPS Multi-Purpose Solution Flat Pack Best contact lens solution I've used! Review Renu MPS Multi-Purpose Solution Flat Pack Good product. Good value. Review Renu MPS Multi-Purpose Solution Flat Pack Used this lots but also get on with cheaper supermarket brands just as well and usually they're a more economical choice. Review Renu MPS Multi-Purpose Solution Flat Pack Renu comes in compact packaging and is ideal to put in a suitcase. The brand is well known and the pricing very good. Highly recommended. Review Renu MPS Multi-Purpose Solution Flat Pack Inexpensive option for soaking lenses during those times when it feels good to rest your eyes. Keeps lenses fresh and clean. Review Renu MPS Multi-Purpose Solution Flat Pack Great product and great price. Will definitely buy again when I need more. 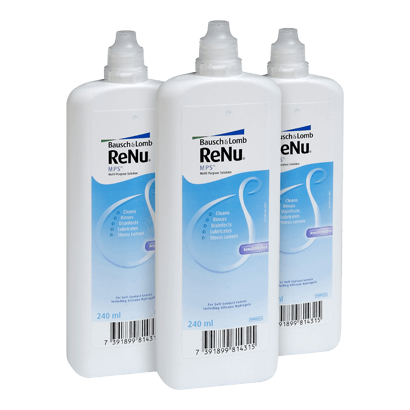 Review Renu MPS Multi-Purpose Solution Flat Pack Great price for three bottles! Review Renu MPS Multi-Purpose Solution Flat Pack Switched after recommended by my optician. Keeps my lenses very clean and am sticking with this product as best I have tried. Review Renu MPS Multi-Purpose Solution Flat Pack Delighted with this purchase. Excellent service and excellent product. Would recommend. Review Renu MPS Multi-Purpose Solution Flat Pack Great value for money compared to high street prices, will buy again! Review Renu MPS Multi-Purpose Solution Flat Pack Great value for money. Review Renu MPS Multi-Purpose Solution Flat Pack Good value pack, high quality solution. Review Renu MPS Multi-Purpose Solution Flat Pack I am impressed with this solution as it cleans the lens far better than the one I was using from my optician. I will continue to use it. Review Renu MPS Multi-Purpose Solution Flat Pack Good value.could do with small travel package less than 100 mls to take on flight. Review Renu MPS Multi-Purpose Solution Flat Pack Quirky packaging, but a good price compared with similar products. Review Renu MPS Multi-Purpose Solution Flat Pack It's my first try to buy lens solution online. I have to say the products are extremely good. Review Renu MPS Multi-Purpose Solution Flat Pack Good buy! Review Renu MPS Multi-Purpose Solution Flat Pack The solution are really nice, it makes my lenses fresh n comfortable. N the shipping are veeeery fast!! Review Renu MPS Multi-Purpose Solution Flat Pack Excellent & great value for money. Review Renu MPS Multi-Purpose Solution Flat Pack Lasts ages! Review Renu MPS Multi-Purpose Solution Flat Pack Great product, great price, great delivery. Review Renu MPS Multi-Purpose Solution Flat Pack Good value. Lenses are clean and comfortable to wear. Review Renu MPS Multi-Purpose Solution Flat Pack Perfect size and shape. Great product inside! Review Renu MPS Multi-Purpose Solution Flat Pack Very good !!! Review Renu MPS Multi-Purpose Solution Flat Pack Excellent quality. Review Renu MPS Multi-Purpose Solution Flat Pack Excellent solution for soft lens wearers. The bottles are nice and thin so can fit will in small spaces. Review Renu MPS Multi-Purpose Solution Flat Pack no different from others. I would prefer bigger botle and less price. Review Renu MPS Multi-Purpose Solution Flat Pack There's not much to say about solution but it seems to work alright and it's not too expensive. Review Renu MPS Multi-Purpose Solution Flat Pack I really like it, using 2 year without any problems. I also like this flat bottle because it is not taking to much space. Review Renu MPS Multi-Purpose Solution Flat Pack This product works really well. It is extremely convenient to have all my products delivered so quickly. Review Renu MPS Multi-Purpose Solution Flat Pack Excellent product. Review Renu MPS Multi-Purpose Solution Flat Pack The Solution cleans very well. The bottles look really nice and are very comfortable. Many thanks and I love the little bag of sweets. Review Renu MPS Multi-Purpose Solution Flat Pack Good product at a good price, delivered in a timely manner! Review Renu MPS Multi-Purpose Solution Flat Pack Great product and good value for money. Review Renu MPS Multi-Purpose Solution Flat Pack Excellent value for money. Review Renu MPS Multi-Purpose Solution Flat Pack Very good value for money and very good quality for that price!! Going to buy them again! Review Renu MPS Multi-Purpose Solution Flat Pack Good multi purpose solution, very good value for money, recommended. Review Renu MPS Multi-Purpose Solution Flat Pack Great Solution and very handy as the bottles are flat and small. Review Renu MPS Multi-Purpose Solution Flat Pack High quality product and very good value for the price. The flat design is also very handy. Review Renu MPS Multi-Purpose Solution Flat Pack Good value of money. Nothing complain about it. Review Renu MPS Multi-Purpose Solution Flat Pack very good lens solution!! Review Renu MPS Multi-Purpose Solution Flat Pack I've had problems with 'cheap' solutions (eg 'supermarket branded solutions) and now only use recognised 'better' brands - the ReNu is excellent and causes no discomfort at all, and the price is right too. Recommended. Review Renu MPS Multi-Purpose Solution Flat Pack I have never had problems with Renu solutions, the comfort is amazing. And this is a great deal as well! Review Renu MPS Multi-Purpose Solution Flat Pack Excellent value for money compared to similar products. The flat pack shaped bottles is a bit impractical, although that’s due to personal preference! Review Renu MPS Multi-Purpose Solution Flat Pack Easy to use and not stingy!! Review Renu MPS Multi-Purpose Solution Flat Pack The best multi-purpose solution I've found, keeps my lenses clean and comfortable and is very affordable! Would recommend Renu MPS. Also it's great value for money. Review Renu MPS Multi-Purpose Solution Flat Pack After years of dealing online with Specsavers - Vision Direct offered not only cheaper lenses and solution but much speedier delivery - my order came 1 day after ordering online. Needless to say I will not be returning to Specsavers! Review Renu MPS Multi-Purpose Solution Flat Pack I have sensitive eyes and this solution is really good, i have no problems using it and find it does not irritate like some can, will be ordering on a regular basis. Renu MPS Multi-Purpose Solution Flat Pack I prefer the flat pack as I can store it more easily. The product is still the same, good quality but the bottles are just nicer. Renu MPS Multi-Purpose Solution Flat Pack I have used the normal Renu MPS bottles before but these are a lot better as they fit through my letter box. No more going to the post office! Renu all the way! My go-to solution for years! My lenses feel fresh and don't dry out my eyes as quickly when I clean them with Renu. I prefer the flat pack - it's so pretty! Love it! Normally I would have to pick up my order at the post office because I'm very rarely at home but this time I found my solutions in the letter box. Amazing! Good I feel like Renu cleans my lenses well but when I insert them right away my vision is blurred for a few minutes. After that everything is fine though. I recommend it! When I use Renu my lenses feel more comfortable and clean. The price is great, too! Renu It's okay, nothing spectacular. Convenient! I have tried many solutions but I like Renu best. I used to buy the normal round bottles but I'm glad I switched to the flat pack. Now I get my solution through the letter box and don't have to pick them up at the post office. Renu MPS Good price and solution! Love it! My eyes don't get irritated and my lenses are very comfortable after cleaning them with Renu. Great! Great contact lens solution and the packaging is very handy for storing! ReNu MPS Multi-Purpose Solution was the first all-in-one multi purpose contact lens solution to be used by patients, and it’s still extremely popular today. Why? Because it combines a winning formula that gently cleans, disinfects and stores all soft contact lenses (including silicone hydrogel) overnight without the need for additional cleaning products.